Under the Polka Dot Tree: ahhhh.....Fall. The blog hop will be of your Fall/Halloween decorations! Since I LOVE Fall and the orange it brings to my life, i thought it would be great for us to visit each others blogs and see each others ideas for cute Fall decorations!! I don't know how to set up a linky thing soooo, for now just leave a comment that will link to your blog and the post that shares your Fall decorations. I can't wait to see your Fall decor! **Above you will see a couple of my decorations...blogger isn't cooperating so this is all i could upload...for now. 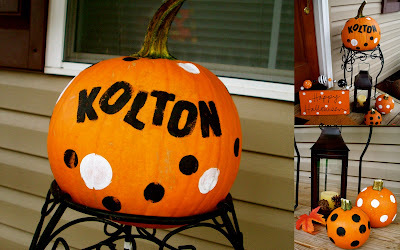 i painted these pumpkins and personalized one for kolton. What else did you think I would do to pumpkins....carve them?...nope i polka dot my pumpkins!! I also did one that says The Goins'. Oh, i just love Fall...more pics to come. OK so I will have to have one that says the sextons! !